Projects in charge at Tezuka Architects. 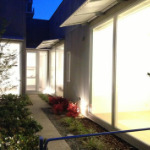 Link to Tezuka Architects. A church, residence, hotel design in charge. Link to Olson Kundig Architect. A convention center, office building, college facility in charge. Link to LMN Architect.